The historic fort of Belgaum built in 13 century (Originally built by the Ratta dynasty, later fortified by Yakub Ali Khan of the Bijapur Sultanate) was well known for its unique building structure and its huge moat surrounding the fort, which made it inaccessible to the enemies. The Belgaum fort served as a bulwark against the attacks of invading armies. It steadfastly held fort as Belgaum played host to a multitude of dynasties, from the Rattas, the Vijayanagar emperors, Bijapur Sultans, Marathas and finally the British. 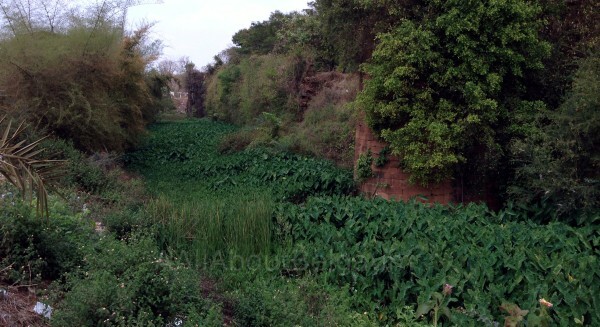 In January 2010 a makeover plan was made for Rs.10 crore to repair the boundary walls and clean up the moat which is now filled up with mud and bushes. But nothing seems to be visible in reality. In 2012 aswell a plan was made but nothing changed in reality. The fort stands, it forms an irregular oval, enclosed by a deep ditch, which is cut out of a softish red stone, which hardens on being exposed to the air. The exterior of the fort is surrounded by a fine broad esplanade; the revetment rises about thirty-two feet above the bottom of the ditch. The interior is level, and extends about a thousand yards in length, by eight hundred in breadth. The original entrance was made between two magnificent battlemented bastions, which still exist, although the gate, which once opened upon a bridge, has been walled up. The present main gate, which is a solid pile of building, is considered to be a fine specimen of Indian architecture. It must at that time have been a place of strength, as it is mentioned in history as being protected by strong towers and lofty walls, guarded by a deep wet ditch, and by a pass near to it, the only approach to which was fortified by re doubts. Even the old-aged among the city’s population may not have seen it filled to the brim. The administration and our elected representatives must take such matters on priority to make this a tourist destination as other similar forts with moat in Vellore and Jaipur have been desilted, cleaned and water filled. The moat filled with water would attract more tourists. It will also benefit the surroundings. It will help recharge the wells and ponds. The revival of the water channel and introduction of boating, water sports and recreational facilities along the circle would change the landscape of this place. AAB had written about the state of the boundary walls of the fort on 08 January 2010, Belgaum Fort loosing its grandeur.